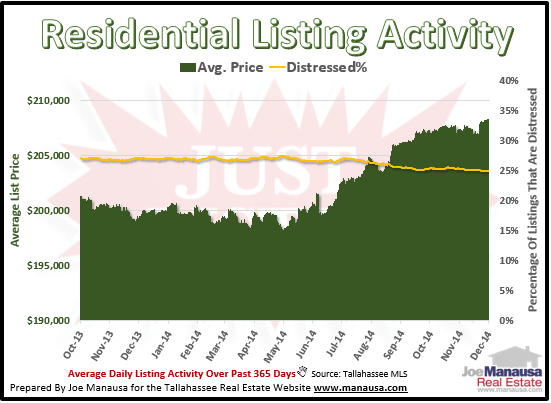 As we continue to scour the Tallahassee MLS for signs of change in the housing market, one trend has become readily apparent. Home sellers are asking for more these days, and it is a trend that took off back in June. The average asking price for a home for sale in Tallahassee is up more than 4% since the beginning of June, and current trends suggest this growth might continue through the Spring selling season in 2015. The average home price in Tallahassee, based upon what current home sellers are asking, has reached $208,300 as of the final day in November. It appears as if the decline in distressed property listings is reducing the number of lower-priced properties and creating room for home sellers who have been sitting on the sidelines (the real estate shadow inventory that we discussed in a prior post) waiting for higher values that would let them finally sell their homes. In the real estate graph above, the green columns measure the one-year trend (365 day average) of the asking prices of homes for sale in Tallahassee (measured on the left vertical axis), while the yellow line measures the trend of the ratio of distressed properties to all properties entering the market (measured on the right vertical axis). The yellow line declining means that fewer distressed properties are hitting the market, which we believe will make room for arms length sellers to get in front of home buyers after many years of waiting. Currently, there are more home sellers with fewer distressed properties hitting the market than we have seen for several years. When we look at a handful of homes for sale right around this average price, we find a broad collection of types and locations. As of this writing, there are 16 homes for sale priced between $206,000 and $210,000. I hope our report on average home price in Tallahassee helps you better prepare for your next transaction in the Tallahassee real estate market. Of course, if you need more information, please drop me a note and we can schedule a time to answer your questions in greater detail.